Alternate title: The Day I Lost My Precious Shiba Inu. I found her. However, it was unbelievably horrific for me. And everyone that had to be affiliated with me. The first picture is just minutes after she was found, and the second was today (three weeks later). She is back to her fluffy, healthy self. 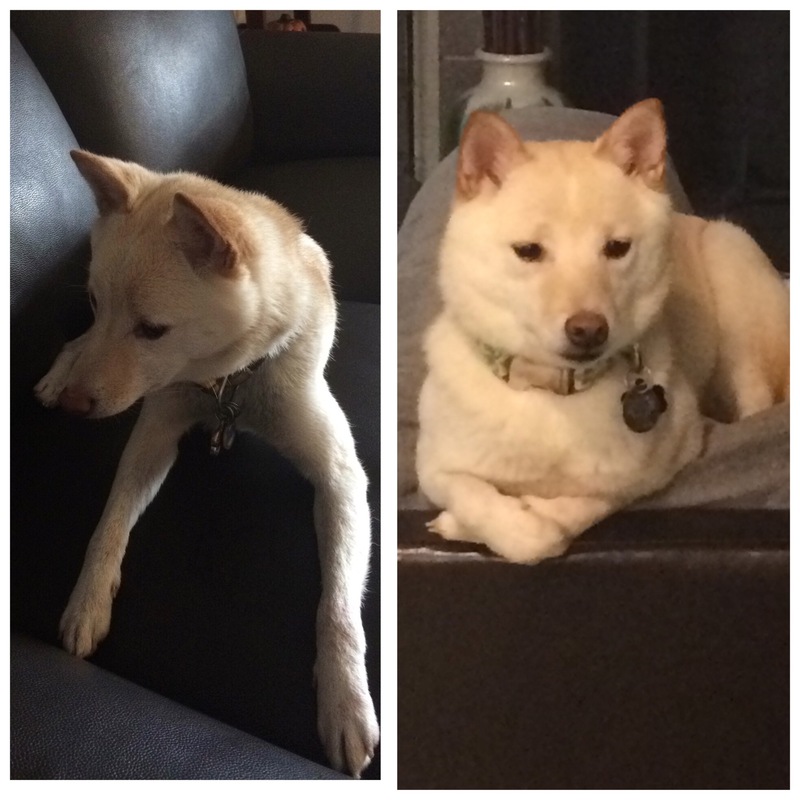 Here is what happened- a cautionary tale about how serious it is when a Shiba Inu gets out off leash (something no one without a dog like this doesn’t understand without seeing first hand), but also a story about how there are some amazing people in the world. I live in the biggest metro area in my state (Portland, Oregon, so still not anything that huge), and I went to see my sister one Sunday afternoon. My sister lives about an hour and a half away from me, in a much smaller city (it’s about 30,000 people). Riley was playing with my sister’s dog, and the two dogs escaped out the front door on Sunday at 1:30 pm. Two of us chased them on foot, and two chased them in an SUV. My sister understands what Shibas are like, so she knew a car would probably by needed to keep up. We were only able to catch my sister’s dog right away. She ran for about a mile, but stopped when my sister caught up and called for her. No such luck with Riley. Shiba Inus are very known for running and never coming back. I had been running and calling her for a mile, and I hadn’t even stopped to put on shoes. She just kept running and didn’t even think of stopping. She crossed traffic and ran into a park. None of us were able to see where she went from there. It became obvious to everyone in the park pretty quickly what we were doing. A few people had seen her and tried to direct us to where she had gone. One person lent my sister his bike. Another man helped us look all afternoon. Later that night I ran into the same man again when I was looking with my family. Right after I walked away from him he called out to me- he actually spotted her. Sadly, I was unable to catch her. She was too scared and too far away. It was pitch black at the time and we lost her quickly. This is worth noting. It now gets dark here at about 5 pm, and it was POURING rain almost the entire two days Riley was lost. So, most of the time we could barely see. We looked around the clock and were freezing and soaked most of that time. I forgot what it felt like to have dry feet. At one point I was convinced to stop at Taco Bell for food and the cashier (out of the kindness of her heart) offered me free stuff. Umm, she thought we were homeless. That’s how run down, wet, cold, and traumatized we were. Again, I would like to point out how nice people are. Even though I didn’t need or accept free food, it was nice that she cared. I posted an ad on Craigslist (and some friends placed ads other places, and in general helped me advertise that Riley was lost). I got a text from someone who runs a Facebook group for the area, just for lost pets. She quickly added me and I posted our story. Riley’s dad posted a reward, and people started looking. Complete strangers came to help, some from different towns. They searched for hours. At the time I thought it was for the money, but in the end I offered money to all who helped and not one person took it. We needed the help desperately. Every second was living horror and guilt, convinced we would never find her and she was hurt, cold, and/or hungry. We looked for Riley for almost two full days with very little food or sleep. This community was amazing, and all of my tips came from there. Sightings of Riley were only thing that gave us hope (and she traveled several miles. Without them we may have never located her). Tuesday morning I was so discouraged and couldn’t get out of bed or stop crying. I was so afraid I would never see her again after Sunday and Monday of searching and not feeling any closer. She is also scared of almost all people, so I knew there were only three people that might be able to grab her. I was making flyers when my other sister messaged me (from Kansas! Helping long distance!) that Riley had been spotted again. We saw the location and took off. Several people were searching the area. My friend and I turned down a side street at about 8:30 am. He slammed on the brakes and cried out because he saw her. His doors lock automatically and he was trying to open my door and so was I!! I jumped out and she took off. He sped ahead and stopped ahead of where she was. I had her leash, favorite toy, and treats. She ran from him toward me, but was still skiddish. I lured her with her ball. I grabbed at her three times until I had her. We had a group hug and were in total shock. I fed her a turkey strip treat. She seemed unhurt, but was filthy and lost almost three pounds. Riley seemed just as shocked as we were. She was so happy when she got food, water, and felt safe. She slept for four days straight. The vet examined her and she had a few cuts on her paw pads, but nothing major. I have a step tracker and I walked/ran over 50,000 steps while Riley was lost- roughly translating to 25 miles. Much of the time I was on a bike, and some of the time I was in a car. That time isn’t even counted in the 25 miles. I can only imagine how much ground Riley covered. Besides that I never want my dog out of my sight again, I thanked that Facebook group and community SO MUCH for their help. I would never have expected all of the love, help, and prayers from total strangers. One helper cried when I called to tell her we found Riley. Again, a total stranger that just loves animals and wanted to help. Sometimes from trauma comes beauty and love… And that I guess is the circle of life? I will have an upcoming post about how to keep a Shiba Inu inside and safe. It’s an ongoing battle, like wrestling a fish. I swear. Happy thanksgiving, all of you in the USA! Thanks 🙂 that is what I am thankful for today. She makes me happy every single day! It’s an awful feeling trying to find your dog that loves to explore. I recently helped a friend do the same thing you went through. So glad she was found safe and sound. I’m so glad your friend found their dog! Losing your pet is so scary. It took Riley and I both quite a while to get over it. She was so tired and hungry and stressed, she just slept for four days straight. The awesome community of supportive people it’s creatively true but you left out that it was freezing and raining (not a little) and the middle of the night or at least dark for most of it. Also, it was a much worse than this blog makes it seem like. Yeah. Well, my post accidentally published in the middle of the night when it wasn’t done. Then I had to fix it the best I could while exhausted and drugged yo with cold medicine. You’re right!! I need to work on harnessing the panic and horror. Ugh. The awfulness. OMG. I was on the edge of my seat reading this! I’m SO glad you found her! How freaking scary! Hugs! Thank you ❤️ it was among the worst days of my life I didn’t know if I was going to make it if we didn’t find her! Love my produce stand. Every time I shop there I truly feel like I have reached a major milestone of success. Your dinner sounds yummy and isn’t amazing what you have on hand like stock..… lol. Bon Appetite- thanks for reading. Thank you! She is the love of my life!